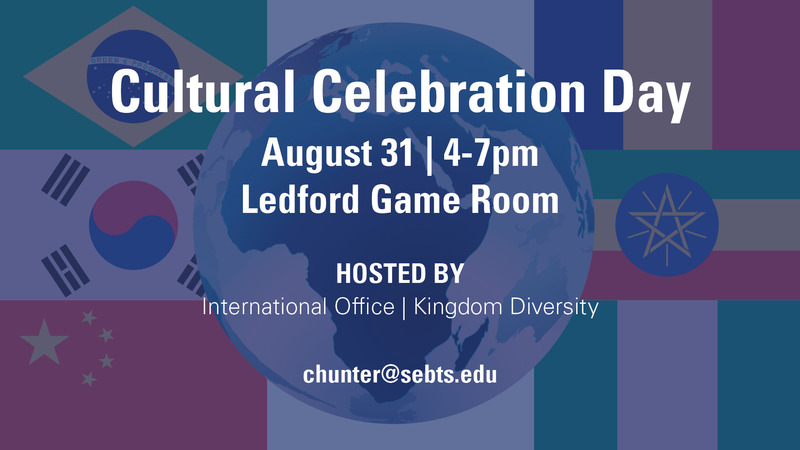 Join us as our International Student Services and Kingdom Diversity offices are hosting a Cultural Celebration Day event on Friday, August 31st!! We will be featuring music, dance, reading scriptures in different languages, tables with items from the different cultures, tables with food samples from different nations, and more… There will even be an activity for kids where they can earn a small prize for completing it! We are closing the event with an international worship service. We are SO excited to see the different cultures represented and taught on our campus!! This event is open to all students and families affiliated with SEBTS, whether you’re from across the globe or just from across the street!